Subornokhuli Govt. Primary School has been announced as a child friendly school by Sheikh Mohammad Belayet Hossain, (UNO of Nilphamari Sadar) on 18 July 2017, in the presence of more than 500 community people. 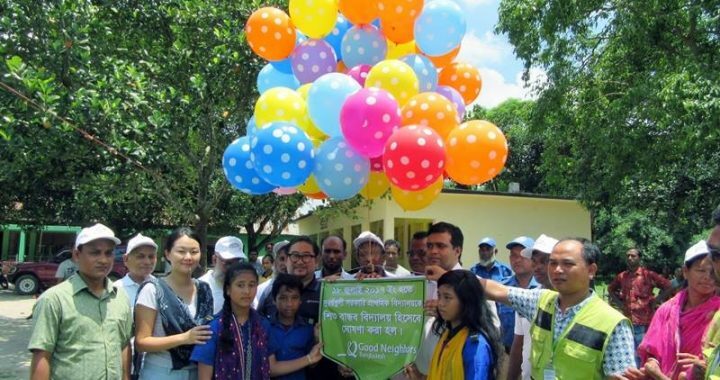 Mr. Jeoung Sek Kim, Country Director and Yang Hee Kim, Managing Director of Good Neighbors Bangladesh were the chief guests in the program among many special guests. Mr. Shahinul Islam, Team leader of Edu & Protection team from Operational Department of Good Neighbors Bangladesh, Upazilla Education Officers, Union Parishad Chairman & Word Members of 12 No. Sangalshi Union, SMC members of 6 schools, guardians and students took active part in the program. On this very day, 750 books for library had been handed over to SMC of this school and to encourage children to read books reading campaign award was handed over to the best reader children. It is mentioned that towards announcing this school as child friendly school including 5 more schools in Nilphamari CDP area Good Neighbors begun its activities in May 2016 through SMC skill development, awareness building program for child rights & PR materials publications, schools infrastructural developments and renovations, WATSAN renovation and library development.